There were a couple of books I read at the end of last year that I meant to talk about a bit more but you know how that goes. So I thought I’d write a quick wrap up summary of each one. Charlotte Brody is hoping to put the past behind her and make a fresh new start in Cordova, a frontier town in the Alaska Territory. She is lucky to have her brother Michael to show her the ropes in but she’s eager to find her own way too. While there are sidewalks, local businesses and boarding houses, Cordova is still a rough place and no sooner has Charlotte gotten settled when she becomes involved in the investigation of the murder of a local prostitute. Along the way Charlotte will learn more about her brother’s own life in Cordova, she’ll meet a charming deputy marshall and of course manage to offend the sensibilities of some of the more well to do families in Cordova. I thought Charlotte was definitely a character I would love to visit with again. She’s a woman ready to be more than a socialite. She wants to write newspaper articles, experience life and seeks equality for women. Sara’s correspondence with Amy had led her to make the decision of finally doing something daring. She’s quit her job and has left Sweden for Broken Wheel, Iowa to meet her pen pal. Unfortunately when Sara arrives in Iowa she finds out that Amy has died. The townspeople though take on Sara as the town’s guest. They set her up in Amy’s house, drive her to and from and help her get adjusted. They find her a bit odd, a young woman who is quiet and reads too much, but if Amy was her friend then they’ll take care of her. For Sara, she feels like she already knows a lot of the townspeople as Amy made them come alive through her letters. And, rather than heading back home immediately, Sara decides that what Broken Wheel needs is a bookstore filled with Amy’s treasures. She knows that there is a book out there waiting for everyone. Before too long everyone in town feels like Sara is one of theirs and Broken Wheel suddenly doesn’t seem like the sleepy little town anymore. I thought I would love this book with its main character who loves books and the quirky characters that a small town is sure to have but while I enjoyed the quirky characters and their stories, I found one aspect of the book seemed forced and that was Sara’s relationship with Tom but overall this did make for a light, pleasant read. I think that yours is not the first review that mentioned some issues with the Broken Wheel book. It sounds perfect, but I don’t think it has been completely satisfactory to a lot of readers. However, I have a copy of it and will try it at some point. Oh and the other book sounds good too. Alaska – I always like books set in Alaska. 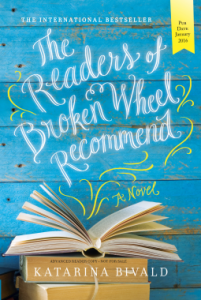 I’ve read a few reviews of The Readers of Broken Wheel Recommend and they’ve been good so I’m intrigued with it. 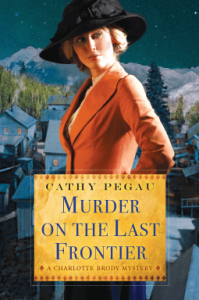 Murder on the Last Frontier sounds interesting too! Love the cover of Murder on the Last Frontier, and I’m still on the fence about Readers of Broken Wheel Recommend. Readers of Broken Wheel Recommend sounds almost too perfect! It sounds like something I would like but maybe not really believe…. As much as I love books about readers and bookstores, Readers of Broken Wheel Recommend sounds like it’s just an “ok” read. Maybe someday I’ll give it a try, but it doesn’t sound like I need to rush out and buy a copy. Have you read The Storied Life of A.J. Fikry? That’s a great “book-lovers” read! I loved it! I really like the sound of Murder on the Last Frontier. Alaska Territory as the setting . . . I will have to look for that one. I really enjoyed The Readers of Broken Wheel Recommend. I may have over identified with Sara a bit. Improbable, yes, but I didn’t mind. since I was having such fun reading it.